In the Fall of 2000, I adapted and staged Dr. Bronner’s unique soap label as part of a series of live performances in New York City. When I wrote to the company asking for donated bottles of soap, I was shocked not just to receive a huge box of the pepperminty product, but also multiple phone calls from VP Ralph Bronner himself. In retrospect, my surprise points to a disturbing fact about modern life–that companies generally feel like disembodied entities, amorphous enterprises surrounded by walls of computerized responses and form letters. This disconnect fuels a sense that no one is actually there, which ultimately contributes to an atmosphere in which no one feels compelled to take responsibility for unsustainable and dehumanizing business practices. Ralph, like his father before him, chooses to be more available than your average multi-million dollar business owner. He prints his home phone number on every piece of corporate literature, hugs nearly every one he comes across, and personally gives away vanloads of soap–one bottle at a time. In addition to documenting the history of an unusual family and a tingly soap, this film hopefully creates space to think about the possibilities of a business model that allows for both social responsibility and human interaction. From the beginning what most moved me about the Bronners was the entire family’s shared ideal of “Constructive Capitalism,” where, as Dr. Bronner long insisted, “You share the profit with the workers and the Earth.” Every member of the family has a particular way of engaging this ideal, but the sum total is a group of people who make a connection between how they behave and the welfare of all of us. 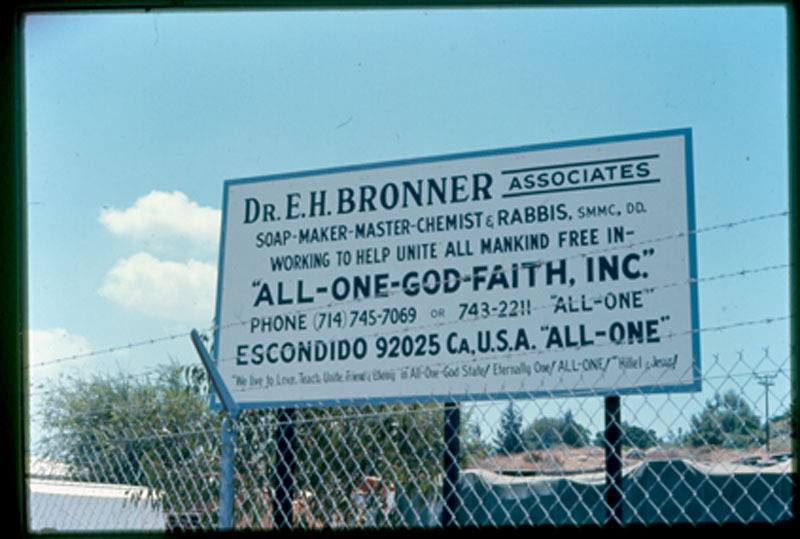 I have been enormously impressed by the surprising and creative ways that both Dr. Bronner and Ralph managed to transform their own suffering into a desire to relieve the suffering of others. Using soap, manifestos, and indomitable spirits, they have created consistent and subtle change in people’s lives. David and Mike Bronner also engage their grandfather’s ideals fighting legal battles against the USDA in order to maintain credible organic standards in the U.S. body care industry, challenging the DEA on hemp regulation, and initiating a Fair Trade Olive Oil Project that encourages peaceful coexistence in Israel and Palestine. “Dr. Bronner’s Magic Soapbox” is not exactly a political movie, in the sense that it doesn’t lobby in an obvious way for a particular kind of change. It’s sad and funny and weird and even sometimes uncomfortable–these qualities have always been my favorites for the way they help open the back door to questions like “What is our obligation to one another?” and “What can one individual do?” When we began filming, the Enron/Arthur Anderson/WorldCom corporate scandals were in the papers every day, America was heading to war in Iraq, and I began to see this project as a kind of balm–or maybe an odd-tasting tonic–a bit of relief from consistently troubling and often overwhelming news. For more information about the company’s social responsibility, visit their website: www.DrBronner.com.